Theyyam or Theyyatom is one of the most outstanding and popular ritual art of northern Kerala particularly now found in the traditional Kolathunadu of the present Kannur and Kasargod District. As a living cult with centuries old traditions, rituals and customs, it embraces almost all castes and classes of Hindu religion. 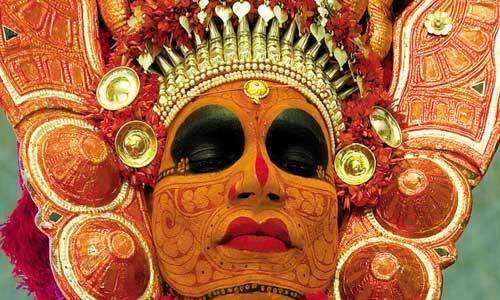 The term Theyyam is a corrupt form of Dhaivam or God. It is a rare combination of dance and music and reflects important features of a tribal culture. The indigenous Theyyam cult under the influence of the great classical Indian tradition incorporated new ideals and legends. However its form and content did not change very much. The popular folk religion based on Theyyam was influenced by the Brahmanical settlements in Kolathunadu like Payyannur and Taliparamba. According to Keralolpathi, a famous historical book, Parasu Rama sanctioned the festival like Kaliyattam to the people of Kerala. 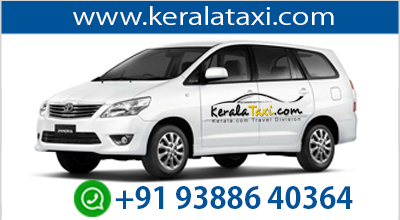 Kaliyattam means Theyyattam or Daivattam, which lasts for 3 to 11 days. He assigned the responsibility of Theyyam dance to the indigenous communities like Panan, Velan, Vannan and Malayan. Velan one of the Theyyam dancers are referred to in the Sangam literature. According to Sangam traditions, he was employed by the mothers of love born girls to exercise the malignant spirits from their daughters. All rituals described in the Sangam works and their commentaries are being observed by Velan and other dancing communities. Kalaripayattu laid down the combat code of the Cholas, the Cheras and the Shrouded in deep mystery and mists of secrecy Kalaripayattu was taught by the masters in total isolation, away from prying eyes. 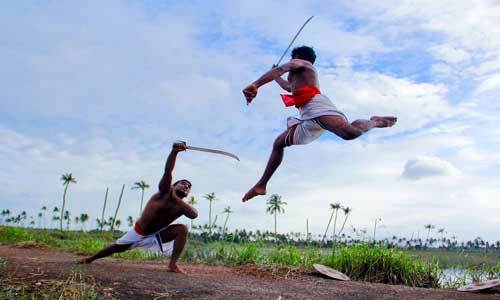 The feats of jumping (Chattom), running (Ottam) and somersault (Marichil) form the integral parts of this martial art form. One of the theatre forms generally described as folk but possessing a strong classical connection is the Yakshagana. 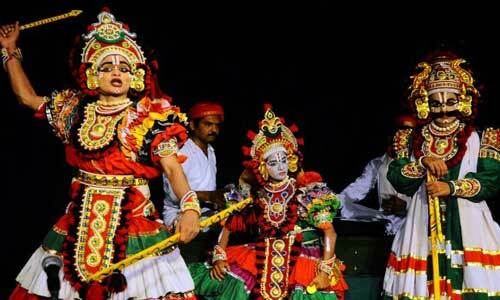 It is a typical folk form of drama in this region, just as Kathakali is in neighbouring Kerala. Unlike the stylised costumes and masks of Kathakali, Yakshagana is a true people's theatre, commonly staged in the paddy fields at night and the themes are the same as all over India, the Ramayana, the Mahabharata and mythological tales from the Puranas. In predominantly rural areas with little or no transportation, Yakshagana enjoys immense popularity and its exponents are honoured just as great stage artistes are. The performances are usually recited in Kannada and is performed in Malayalam as well as in Tulu, accompanied with musical instruments like Chenda, Maddalam, Jagatta or Chengila.